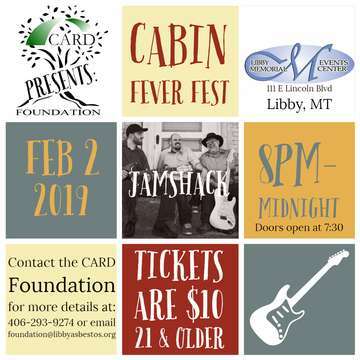 First Annual Cabin Fever Fest fundraiser, featuring JamShack! At the Libby Memorial Events Center, 111 E Lincoln Blvd, Libby, MT. Music starts at 8 pm and goes until Midnight. There will be a Chinese Raffle, 50/50 drawings and a full bar catered by the Halfway House. Come dance off the winter blues!